The general sale of Silversea’s Expedition World Cruise 2021 is now open. 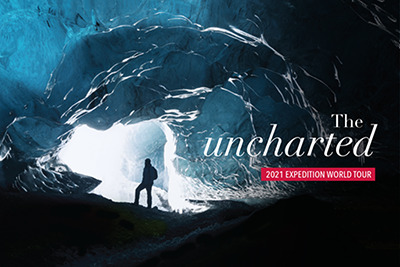 Visiting a total of 107 destinations, the Expedition World Cruise 2021—or the Uncharted World Tour—will depart Ushuaia, Argentina on 30JAN, 2021 aboard Silversea’s Silver Cloud. Travelling for more than 167 days, Silver Cloud will visit 30 countries across six continents, covering a total of 39,000 nautical miles, and will offer guests a wide range of immersive travel experiences: from exploring Antarctica by Zodiac and spending two days on Easter Island, to swimming with rays in Bora Bora and sailing through the Suez Canal. They will enjoy a behind-the-scenes exploration of Luxor; the historical highlights of Greece, Albania, Tunisia and Spain; the ancient monastery of Mont St. Michel, the memorial sites on Normandy’s beaches, and much more, and will conclude by travelling into some of Northern Europe’s most remarkable destinations, including Iceland, Svalbard and Norway’s North Cape. Enriching the experience for guests, a number of experts will join the voyage, offering workshops and lectures, and accompanying shore excursions. In addition to 70 members from Silversea’s industry-leading Expedition Team and Artist in Residence Antony Smith, over 20 featured guest speakers will board Silver Cloud to enhance the cruising experiences, including Felicity Aston MBE—Explorer, Scientist, Speaker & Author; Tim Severin—Explorer and Gold Medalist of the Royal Geographical and Scottish Geographical Societies; and Jo Ruxton—Co-Founder of the Plastic Oceans Foundation. A number of exclusive events will also enhance the voyage, including a special bon voyage reception for world-cruising guests on the rooftop of Palacio Concha, a grand mansion in Chile’s Santiago; privileged access to Robert Louis Stevenson’s former home in Apia, Samoa Islands, for a private dinner; a night at the illustrious China Club, at which Silversea’s guests will enjoy a sophisticated private dinner on the 52nd floor of Singapore’s Capital Tower; a bespoke banquet on the walkway of London’s Tower Bridge; and a Viking farewell to round off the cruise, which will comprise an authentic culinary experience in Iceland’s Kjarnaskogur Forest. Fares for Silver Cloud’s two-bedroom Owner’s Suite cost 443,000 EUR per person for the duration of the 167-day voyage, and the ship’s vista suites start from 87,000 EUR per person. As part of the voyage’s all-inclusive pricing, world-cruising guests will each receive complimentary expedition gear delivered directly to their suites. The kit will include a commemorative World Cruise Polar exploration parka, a waterproof backpack, and various other items of clothing and accessories. To find out more about the cruise, click here.